According to the United Nations, the world population is expected to reach 9.6 billion by 2050. In order to meet this unprecedented demand, global food production will have to increase by 60 percent, in relation to 2005/07 levels. Climate change, water scarcity, and workforce and land availability pose major challenges to this goal, putting the agricultural industry under great pressure. In this scenario, urban farming stands out as a promising alternative. Innovative building-integrated agriculture can reduce the need for water and pesticides, lower transportation and energy costs, and improve freshness of produce. Federal tax credits are available for companies performing research and development activities aimed at advancing urban farming technologies. Eligible costs include employee wages, cost of supplies, cost of testing, contract research expenses, and costs associated with developing a patent. On December 18, 2014 President Obama signed the bill extending the R&D Tax Credit for the 2014 tax year. Six out of ten people will live in cities by 2030. With increasing pressure over traditional agricultural methods, there is a compelling need to develop better ways to feed this growing urban population. Agriculture exerts a major toll on the planet, consuming valuable resources and causing pollution. Recent data show that agricultural activities occupy 40 percent of the world’s land surface, use 70 percent of freshwater withdrawals worldwide, cause 15 percent of world greenhouse emissions, and constitute the largest source of water pollution. This is particularly concerning in a context of rising temperatures, increasing soil erosion, water scarcity, and a growing demand for sustainable, fresh, and organic food. In this scenario, innovative urban agricultural systems emerge as a means to deliver affordable, sustainable, and high quality products; thereby contributing to solve some of the most pressing global issues, such as food security, water shortage, and nutrition deficiencies. By exploiting the synergies between the built environment and agricultural production, the so-called building-integrated agriculture (BIA) is a particularly promising solution. In the U.S., for instance, buildings are responsible for 39 percent of energy use, 68 percent of electricity consumption, and 38 percent of carbon dioxide emissions. This environmental burden can be offset by the transformation of buildings into urban farming locations. BIA is the integration of high performance greenhouse farming systems into a building as a component of its function and operational regime. It includes rooftop installations and indoor or vertical farming, an innovative concept that involves the entire building and not only the building envelope. The potential of this innovative form of agriculture is immense – in New York alone, there are 14,000 acres of unused rooftop space, which could produce food for over 20 million people, according to the nonprofit group New York Sun Works. Plants are grown on a floating raft with roots extending into nutrient media. Ground-mounted greenhouses, not rooftop applications. 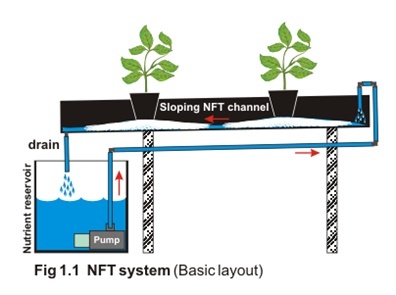 In NFT recirculating systems, the nutrient solution is pumped from a reservoir to the plant’s roots. The excess is drained back to the same reservoir and reused until it is either depleted of useful elements or contaminated, after which it is replaced by a fresh solution. Used for leafy plants, such as lettuce, spinach, and basil. Involves buckets or bags filled with an inert media—such as perlite, vermiculite, or mineral wool—through which the nutrient solution is circulated. Used primarily for tomatoes, peppers, root vegetables, and other plants with more substantial stems. With lighter weights than other hydroponic approaches or soil, NFT recirculating systems are particularly suited for vertical farming applications. Below is the basic layout of a recirculating hydroponics system using the nutrient film technique. Global knowledge sharing platform Meeting of the Minds expects the green roof market alone to reach $7 billion in 2017, $2 billion of which would comprehend polymeric materials, such as geosynthetic fabrics and waterproof membranes. Cumulative green roof installations should amount to 2.2 billion square feet, presenting a compound annual growth rate of more than 11 percent between 2012 and 2017. Urban agriculture can bring major economic and environmental benefits, as summarized below. I. Transportation - Increased urbanization has lead to a marginalization of the natural world and a distancing from food production. Food travels hundreds of thousands of miles to reach urban consumers, adding to traffic congestion, air pollution, and carbon emissions. Experts say that, in the U.S., an average bite of food travels 1,500 miles from where it is grown to where it is eaten. According to the Earth Policy Institute, this journey consumes two-third as much energy as the growing process. Urban farming is an effective way of reducing the “food miles” associated with long-distance transportation, which often involves international routes. In addition to the environmental footprint of transportation, the distance between producers and consumers directly affects prices. According the New York Times transportation can cost as much as $1 for a head of lettuce that will sell for $2. II. Water Consumption – Farms and their wasteful irrigation systems are important contributors to water scarcity. According to the Pacific Institute, California agriculture, for instance, could cut its water use by 10 to 15 percent if it adopted more sophisticated irrigation techniques. Developing new farming methods that use water less extensively is imperative. According to the Environmental Protection Agency, in the last five years, nearly every region of the country has experienced water shortages. Climate change should exacerbate drought, creating a dangerous vulnerability for food producing regions. Recent studies have shown that building-integrated agricultural activities can use up to 95 percent less water than traditional soil-based farming. Highly efficient methods use recycled water and constitute a promising solution to the global shortage of freshwater and arable land. III. Building Efficiency – Integrating vegetation into a building can bring major benefits, particularly when it comes to reducing operating and maintenance costs. First, it can serve as insulation, reducing the absorption of heat and therefore the energy used by air conditioning systems. Second, it can absorb rainwater, mitigating runoffs that often cause infiltrations. Third, vegetation can contribute to an enhanced quality of life for building users by improving urban air quality and countering the heat island effect. Urban agriculture projects are often accompanied by alternative energy projects, such as solar photovoltaic panels. The use of renewable sources of energy is increasingly cost-effective and can trigger a number of government and utility incentives. IV. Product Quality – Urban farming is a great response to consumers’ demand for organic, locally grown food. By bringing production to the city, it actually makes food as “local” as possible. Proximity to consumers translates into freshness. It is well known that vitamins present in fresh vegetables and fruits break down over time. Therefore, when cultivation is closer to the consumer, produce is likely to be healthier. Moreover, freshly harvested food tends to be tastier than those exposed to long journeys. Finally, the smaller-scale production system of urban agriculture can translate into less vulnerability to pests and contamination issues. In huge agribusiness operations such threats can greatly impact food supply and become a national concern. V. Sustainability – According to New York-based greenhouse design consultancy Bright Farms, hydroponics is ten to twenty times more productive than field agriculture, with considerably lower water use and higher reliability. In addition to decreasing water waste, building-integrated agriculture reduces the need for chemical pesticides and fertilizers, preventing toxic runoffs, which are responsible for serious soil and water supply contamination. By eliminating the need for farm machinery and long distance transport, BIA offsets the environmental footprint of agricultural activities. Studies show that urban agriculture can produce 90 percent less CO2 than traditional farming. Even more so, when integrated with waste heat recovery technologies and renewable energy systems that further reduce emissions. The advance of hydroponic growing techniques and innovative greenhouse technologies are fueling an unprecedented adoption of urban farming systems, which emerge as a sustainable, cost-effective alternative to traditional agriculture. Innovation is at the heart of this new market, as it helps overcome challenges such as limited yields and restricted access to water and sunlight. The hydroponic method itself requires highly precise management, which includes carefully measuring nutrient concentrations, adjusting flow rates, and controlling pH fluctuations. Based in Arcata, California, American Hydroponics (AmHydro) is one of the nation’s leading suppliers of hydroponic equipment. The company provides a series of automation solutions designed to simplify the time-consuming and error-prone task of managing a hydroponic system. With complete data logging, remote access via PC, and an easy-to-use interface, AmHydro’s system creates an optimum environment for plant response. It offers an automated nutrient balance, pH and electrical conductivity control, as well as automatic climate control, which covers humidity, light, and CO2 levels. Using recirculating hydroponics, Brooklyn-based Gotham Greens builds and operates commercial scale greenhouse facilities in urban areas for fresh, premium quality vegetable production. With a total of 95,000 square feet, the company’s technologically sophisticated, climate-controlled rooftop greenhouses provide retail, restaurant, and institutional customers with reliable, year-round, local supply of produce. Lighting is a very important aspect of indoor agriculture, where plants must grow without sunlight. Lighting systems are key in determining crop yields, taste, appearance, and nutrient levels. In this context, Philips and GreenSense Farms, a Chicago-area commercial grower, have partnered to develop innovative LED grow lights specially tailored for indoor farms. The groundbreaking lighting solution uses “light recipes” optimized for specific produce, which allow for 20-25 harvests a year. They are based on the notion that plants respond differently to different sets of wavelengths, some of them being more efficient than others. In the past six years, LED prices have fallen 85 percent, and output per watt has doubled. As a result, GreenSense’s system uses 85 percent less energy than traditional lighting methods and offers considerably lower operating costs. 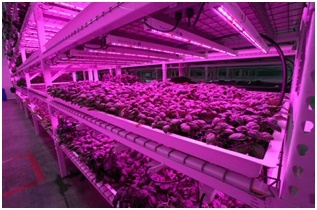 Other advantages include LEDs’ low temperatures, which allow them to be placed closer to the plants, guaranteeing optimal, uniform illumination. Equipped with Philip’s innovative LED grow lights that maximize photosynthesis, GreenSense’s indoor farm covers a million cubic foot and produces organically grown food with no pesticides, fertilizers, or preservatives, throughout the year. In addition to favoring better crop yields, LED lighting infrastructure can serve as the basis for sensor networks capable of capturing and transmitting data about the growing environment. The use of sensor technology and big data analytics are important hallmarks of smart farming, an increasingly common approach to agriculture. MIT’s CityFARM project is an interesting example of how indoor agriculture can take advantage of smart farming resources. 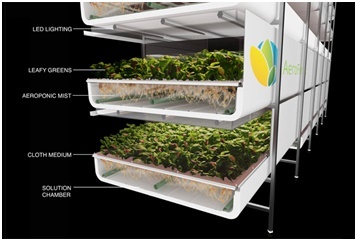 The innovative growing system has multiple points of integrated environmental sensing (temperature, humidity, CO2, pH, etc), resource consumption monitoring (water flow, electrical energy use, etc), controllable LED arrays, RFID and bar code tracking, and an integrated data management and web interface. The institute recently launched the OpenAG, a research network designed to serve as a unifying platform for urban agricultural innovation, invention, data collection, and data sharing. Founded in 2004, Aerofarms is also engaged in enabling high performance indoor agriculture. Based in Ithaca, New York, the company developed state-of-the-art technology that uses aeroponics, a process of growing plants in an air or mist environment without the need for an aggregate medium, such as soil or water. In aeroponic systems the plants’ roots are constantly sprayed with a high-nutrient solution, which makes them grow. In addition to using less space and up to 95 percent less water than traditional agricultural methods, aeroponics requires zero pesticides and enables faster growing cycles and better yields all year long. Aerofarms’ patented aeroponic grower uses LED lighting and sensor technology, for monitoring humidity and room temperature. A control panel built by the Lighting Research Center at Rensselaer Polytechnic Institute allows for the fine-tuning of color wavelength and intensity of light. Aerofarms, which has raised more than $36 million in venture capital, is building a 69,000-square-foot urban farm in a former steel factory in Newark, New Jersey. The location, which will be the world’s largest indoor vertical farming for leafy greens and herbs, is expected to generate 1.5 million pounds of produce per year, enough to feed 60,000 people. The company also has plans for four other farms in major U.S. cities. By 2050, 80 percent of the world’s population will live in cities. Building-integrated agriculture stands out as a means of providing locally grown, fresh food for a growing urban population while overcoming significant challenges that limit traditional agriculture, such as extreme weather patterns, water scarcity, etc. Federal R&D tax credits are available for companies engaged in advancing innovative urban faming technologies.